I’ve been trying for some time to design a building system for geodesic domes that is simple and straightforward to build. Anyone who has attempted building a geodesic dome knows that the preparation and execution can be…well complicated. With this in mind I’ve designed a system that uses a block of wood as the hubs and a wooden beam to join the hubs together. There are two types of block, hexagon (six sided) and pentagon (five sided) each block has a set of hinges fixed to the base that are used to attach and swing the beams into place. When the joints are assembled a large screw can be drilled into the top to fix the joint permanently. Building a geodesic dome using this system should be relatively straightforward. Because the construction is all wood, adjustments can easily be made as the dome is being assembled. Fitting a covering is also pretty straightforward, rebates can easily be cut in the beams to accept glass or ply panels. The only thing to be careful with is the blocks, they need to be very strong and not prone to splitting, as this would weaken the dome considerably. I would laminate the blocks making sure that each layer has the grain running at right angles to the one below. Next I’ll workout the angles for the beams and maybe build a prototype. If anyone can see a reason why this technique wouldn’t work or if I’ve missed something leave a comment below and let me know, I find the feedback most useful. Hi, I work for the Centre for Contemporary Art and the Natural World and we are about to start a year-long programme called 'Wood Culture' - which will be looking at the beauty, usefulness and sustainability of using timber in construction. 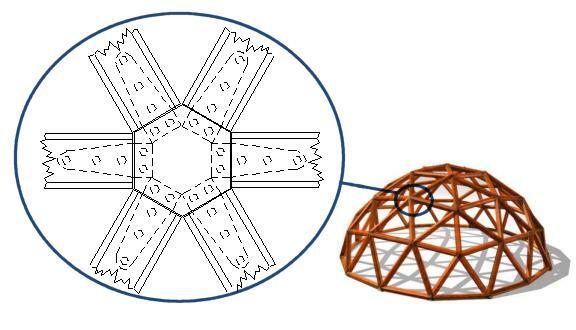 As part of the education side, I want to use a kit of parts for kids to learn how to make a geodesic dome - the joints always seem to be the problem if you want to scale down the size of the dome and use wood lengths. So how is it progressing? Is there a kit of parts which you could design for us?! Hi Colin The end angles are 16 degrees for the short struts and 18 degrees for the long ones. The actual lengths will depend on the radius of the dome you want to build. Hi Justin You certainly have enough space. The frequency of a dome is simply the degree of subdivision to the basic triangular face. 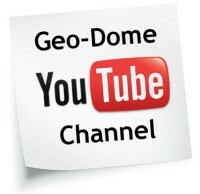 This page will explain it in graphics Dome homes are usually based on the 3v design. what are the angles to cut on a 3v dome and 20ft radius. Need angles for the cuts for the ends of each strut. Hi Deb 10 degrees for the "A" struts (shortest ones) and 12 degrees for the rest. I have made a couple of geodesic spheres using the above mentioned technique of morticing the ends of the struts at the correct angles to take a biscuit and then bolting right through. This was very successfull. I used 2" x 1" tanelised roofing batten, 12mm marine ply and 8mm bolts with washers for one. The other I have properly jointed with all the struts mitered perfectly and glued together. The results are good, the bolted one makes an attractive garden sculpture, the other is smaller and I used it as a background, providing reference to my inspriations backing up my design work in an exhibition. I made the mortices in many differnt ways before i came up with a successfull and easy way to produce them. I tried using a bandsaw, tablesaw and basic router jig. The most successfull way was to clamp all the struts togther, ends lined up and then making a jig to support the routers base I just ran along the length. Further ideas i am having... I think it would be a good idea to first chamfer the edges to create a flat plane on each triangle on which to attach any sheet material. What i cant work out is what the correct angles should be. I think it would be very useful if someone could supply all of the angles in question. Perhaps a diagram. Im sure they must of been published by Fuller. Some sort of injection moulded chinese made plastic hub that takes standard sizes of timber joist would be nice. The fact that the angles become closer together and less crucial as the frequency increases, as nothing else is getting simpler, is comforting. Hi Kieran As the frequency increases so does the number of components involved. If you don`t work to very close tolerances they will add up to a very large cumulative error. Dear Colin, firstly i want to say thankyou. 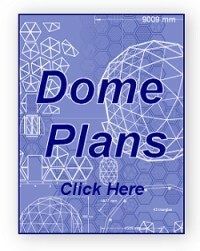 This is a brilliant site and since discovering it i have made 2 domes and seriously read up on bucky and his domes. My first dome was made of bamboo and is 2v with a diameter of 2.6 metres. the hubs were pvc pipe and wall plugs were used to hold the screws into the bamboo kind of inside out of the hub. From this experience i have learnt, bamboo makes for lots of construction nightmares. It is not uniform down its cross section and you can not nail or screw a canvas over it which means purchasing lots of polytunnel fixing tape. So hidden costs i had not forseen. recently i took this good example as my second dome and made it from treated timber, wooden hubs and zinc mending plates. If you shop about on the net these are very reasonable. 9p a throw. i bought a precision hand mitre saw for 15 quid from b and q and two very handy rachet clamps (essential like having 2 helpers). Also in my gardening plans im turning old pallet wood into isometric raised beds. This is in an effort to allow maximum spacial use for the planting. Another thing that has helped me immensely is a program called geogebra this i used to plan and also create paper jigs for all my constructions. even the pvc sheeting to ecomomise via tesselation. Anyway it has been a big nevertheless fun journey and someday i aim to have a dome on a mountain top. There are some photos of the work if you would ever like to see them. Hi all, I´m planning a 2V wooden sphere being hung between some trees and struggling with the angle of the panneling as I want to prebuild triangles instead of using struts and blocks. I found the angles for 3V here on this great site but not for 2V. Can anyone help?? Bevel all the B-edges of the Y panels at 79 degrees. For the X panels it is the A-edges that you bevel at 79 degrees, and the B-edge at 83 degrees. Hi everyone. Just came across this site. Glad to see that there are many other geo freaks out there. I have tinkered with these domes for years but now my goal is to build a 4v, 30 foot radius monster green house. Lofty, I know. I haven't seen many 4v's and I want to be unique. Not to mention that the 4v dome has a naturally flat foundation like the 2v dome has. I am a math teacher by trade and have calculated all of the strut lengths and every possible angle for each one. This includes the dihedral angles which are the chamfered angles that Kieran was talking about. I have decided not to use any connectors at all, just glueing and screwing the compound miter joints together. I have no doubt that this will be strong enough but would like to run some tests to experiment. I hadn't considered biscuits until I read Kieran's submission. Thanks. The math really wasn't that difficult, just time consuming. I simply started out assuming I had an icosahedron placed inside a sphere of radius 1. Then I just used vectors to find everything. Going from a dome of radius 1 to a dome of radius 30 is simply a matter of multiplying the strut lengths by 30. All the different angles in a small dome are the same as the angles in a big dome. Incidentally Kieran, the angles you seek are all about 9 degrees in a 2v dome. Oops. Just realized that I only gave one angle. The 9 degrees is for all of the longer struts in the center of the original triangle. The struts that tie into the pentagons, the shorter ones, must have about 11 degrees shaved off. I'm sure 10 would work for both, don't know how precise you want to be. Remember that the long 2v strut has different size triangles on either side of it - if you want to cut a simple 72 degree mitre on its ends then you'll want to bevel one side by 11 degrees and the other side by 7 degrees - remember that the hub's position vector is in the strut's mid-plane. Hi Simon, You're absolutely correct in that the different size triangles create different angles. I simply divided the supplement of the dihedral angles by two to get my results. This will works for the shorter struts since the triangles on each side are the same size. However, it was incorrect to divide the angle by two with the longer struts. Thank you for pointing this out. When I went back to the calculator, my results were slightly different than yours. My numbers were 9.8 degrees on the equilateral triangle side of the long strut and 8.2 degrees on the pentagon side. Again, I do appreciate you pointing this error out. What do you make the strut lengths for a 2v of unit diameter - 0.273 & 0.309? There is only one orientation of the strut that allows the ends to be cut with a simple bevel, and that's when the hub axes are in the strut's mid-plane. Consider a facet defined by three vertices a, b, c with position vectors a, b, c, such that the facets' struts have displacement vectors A, B, C where A = c-b, B = a-c and C = b-a. BxC is an outward-facing normal to the facet, and bxc is normal to the equitorial plane that contains strut A, and the strut is oriented with its mid-plane alligned with that equitorial plane. The bevel angle on the left hand side of strut A is therefore 90 - alpha. which gives the bevel angle on the A strut as 7.22 degrees, and as a check the struts lengths are A=.309, B=.273, and C=.274. Note that the bevel gets bigger as the other two struts get longer, so the hex (equilateral) side of the long strut has a bigger bevel than the pent side. Hi Joe, thanks, I've enjoyed the exercise. at the bottom of the 3v calcualtion tool (scroll all the way down) it shows you the strut angles to cut the ends. You have to think about how the forces are being distributed and transmitted. If you're talking about a dome made from sheet-metal triangles joined together at batterns then at one extreme you have a stressed-skin dome where the panels distribute all the forces and the batterns none, to the other extreme where the batterns distribute all the forces through their hubs and the skin contributes nothing. Structural engineering isn't my thing so I hope you get some better answers than I can offer, but my suggestion is: no, if your 4x2s are structural then they need substantial hubs to distribute their forces, and if they're not structural then you hardly need them at all. Where are you seeing wasted material? I am wanting to build a Panelised 2v dome with out Plywood, I am haveing a hard time figureing out what to bevel each sides of the panel, can i get some help? To prevent the blocks splitting use elm [Ulmus spp]it is almost impossible to split hence its use as wooden wheel hubbs. i'm wondering at what angle to cut the end of the beams because in the calculation tool it says for 'A' to be cut at 80 degrees, 'B' at 78.3 degrees, and 'C' at 78 degrees. BUT then I'm reading elsewhere on the site to cut the 'A' beam at degrees and the rest at 12 degrees. Any insight? Hi Mark, first off you don't need to worry about decimal places as your saw won't be able to cut to 0.3 of a degree. OK on an 'A' strut you set the saw to 10 degrees and cut the end, this leaves 80 degrees on the end of the wood. I am planning a 6 foot radius 3v stressed skin dome. I have everything figured out except the foundation angles. I am planning on riser walls but have not found anything that helps. Any advice or links would be appreciated. I am looking for the hub axis angles for the the struts on a 4V dome. Do the length of the struts have to take into account the width of the hub? I am building a small geodome that I plan on tipping to its side and putting on a base. I am going to use it for outdoor seating. Any advise. Building a 3v 5/8 dome and I need to know if the struts are beveled on the edges. If so, at what degrees for A,B! And C. I am not speaking of the end cuts here but instead the length of the struts. Please advise. Thank you! I am not using hubs only triangled wood struts. 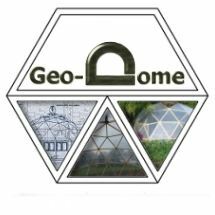 i have seen in several online blogs about geodesic domes with varying degrees when regarding the angles of the hubs. Are all the hexagon hubs regular (60 degrees) and all the pentagons regular (72 degrees)? To Colin, first comment. I am interested in this 18 mm plywood hub cap strategy, but it is not making any sense to me at all. Does this cap go on top of the hub and overlap all the studs to connect them, or is it like a buffer zone between the stud and hub which have to be notched. Not sure how a coach bolt can be secured. I am trying to build a 20ft Bio-dome can you tell me how long my 2x4's have to be and will all struts be the same length? The struts are 10 and all others 12 degrees can u tell me if that's right? im looking to start a dome. im thinkin 30ft diam 2v on 9 foot walls. im unsure of the angles and bevels at strut connections. any help? or examples of connection points would be helpful also. Hello, Im a carpenter with tons of framing experience and quite confident int the bevel and angle cuts of the 3v dome. I am confident with the strut calcs, bevel and angle cuts I can follow and accurately cut them all. My question is what is the bevel angle down the length of the strut for a 3v dome in order to attach the outside panel to the center of each strut. When I framed homes I would often bevel my hips and vallys so there was no gap under the point of the hip if the member was wide. I can't seem to find the bevel angle for this does anyone know or is it so insignificant it's not worth it? I am thinking of building a 2v dome , using 2x4 timber struts. The diameter is 4880 mm . I have used the calculator on this site and the length of strut B is showing 1508.03 mm . Am I right in assuming that this is the overall length of strut after angles are cut and compound miters removed . I would like to join all struts without using hubs, hence the compound miters. regards Ger.